This blog post follows on the article «Planned behaviour, risky decisions and mental shortcuts when designing a live video on social media for a football club» and discusses how Italian Serie A side Juventus FC uses heuristics to design Facebook content. This post adds to the discussion of how mental shortcuts help users make decisions on social media. Yocco (2016) mentions six heuristics for web design and states that “in psychology, heuristic is a fancy word meaning mental shortcut” (p. 57). In the context of this blog post, heuristics help receivers of the following Facebook posts – Juventus FC followers on Facebook – evaluate the decisions they are asked to make. Yocco (2016) explains that “People assign the highest value or likelihood to the outcomes they think of first” and that a brand can address the availability heuristic “by supplying users with relevant examples of how your product [or brand] meets a need they have” (p. 57). The Juventus post shows pictures reminding recipients of ’the best skills in the UEFA Champions League’. This depicts high-quality football and aims at bringing (and keeping) the Juventus brand top of mind when people think of high-quality football. Emotions happen before thoughts and matching emotions with the message a brand wants to convey is crucial (Yocco, 2016). The following video post helps viewers ‘relive all 21 UEFA Champions League goals’ from Juventus in the season 2016/17. It addresses the emotion of winning and hope to win the UEFA Champions League finale – consider that the post was published before this year’s final game. The familiarity heuristic is defined by “the assumption that what has happened in the past will hold true in the present” (Yocco, 2016, p. 61). This can be applied to the design of Facebook posts, which includes staying true to formats, symbols, colours etc. that followers are familiar with. The following post communicates that the UEFA Champions League finale is only five days away by portraying two Juventus players in their classic jersey kicking the traditional UEFA Champions League football, and all is based on the traditional colours of the club, white and black. Yocco (2016, p. 61) explains that the escalation of commitment is like the sunken cost commitment, which says that “individuals remain committed to an action or decision based on the prior investment of time.” The following Juventus video post refers to ‘The final act in Cardiff’ – the UEFA Champions League finale. It can be argued that if someone has been following the UEFA Champions League tournament since the first round in the summer of 2016, that person might want to know how the story ends June 2017, given the amount of time she or he has invested. According to Yocco (2016, p. 62), “Users are likely to engage in a behaviour that makes them part of an exclusive group.” This scarcity heuristic is based upon several different dimensions. One is the feeling of belonging to an exclusive group. 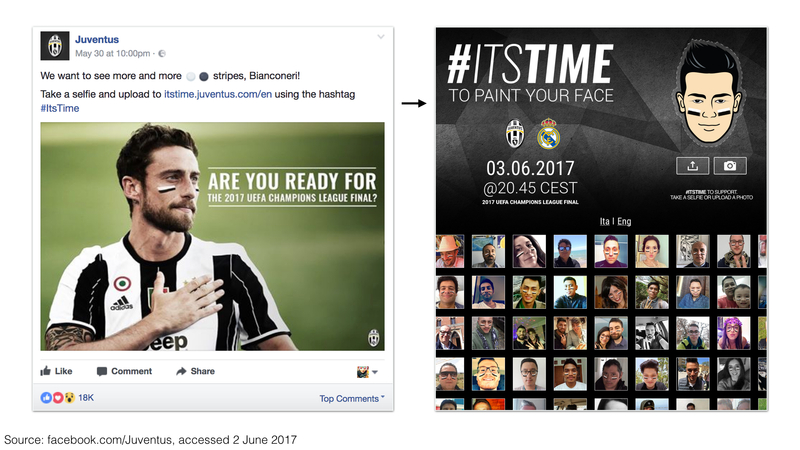 Besides Juventus enjoying a large following worldwide, it can offer a more immersive experience to its followers by inviting them to engage through the #itstime campaign and upload a selfie of themselves to show their support for the team. A further way to create exclusivity, is the ‘A message for Ju’ campaign that offers followers the opportunity to write words of support for Juventus on a banner that travelled from Italy to Wales before the UEFA Champions League finale. Yocco (2016, p. 63) claims that “Stereotypes are heuristics” and he recommends not to incorporating them into a design. In the context of social media communication it becomes apparent when thinking about the behaviour of users in regard to socio-demographics. Different generations in different geographical locations use different social media platforms in a different way. As you might have gathered, ‘different’ is the keyword here. Juventus FC addresses various user groups (mostly) in their respective languages and with messages relevant to them and their culture. The following posts show how Juventus addresses Italian followers in Italian, Japanese followers in Japanese, Indonesian followers in Indonesian, and wishes their Arab Facebook followers a Happy Ramadan. As Yocco (2016, p. 57) states, “Anything can be a heuristic.” A brand can use these in order to facilitate the decision-making process and lead users towards the outcome the brand desires – see blog post «Planned behaviour, risky decisions and mental shortcuts when designing a live video on social media for a football club» for context. The goal is not to choose a heuristic and then craft a message around it, but to apply a heuristic in concordance with the outcome the brand is aiming its followers to achieve. For instance, if the FC Xample brand desires to persuade their followers to subscribe for their subscription-based FC Xample TV, it can apply the emotional heuristic combined with the scarcity heuristic to the communication through Facebook posts or live videos. I invite you to analyse the Facebook page of a football club you like and try to find at least one post per heuristic, as described above. The next blog post will discuss motivation, ability, and trigger to explain when a brand should ask its users to engage in a desired behaviour. Yocco, V. S. (2016). Design for the Mind: Seven Psychological Principles of Persuasive Design, 1st ed., Shelter Island, NY: Manning Publications.